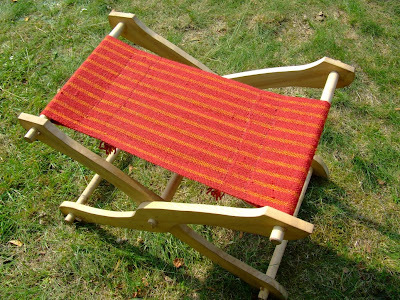 Before I start talking about the feast, let me show you another crafty thing I made last week - on Sunday I sat at the loom and made a stool seat for my friend. ^^ It was a last minute work just before we went to the cottage on Monday, it's red and yellow wool (scratchy, yikes...) from my tangled supplies. And now the main subject of this post - the feast. 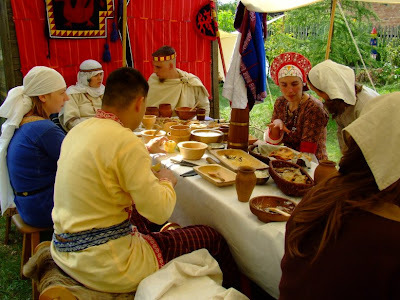 Last Saturday we held our annual medieval feast, the style was in line with our main medieval reenactment project - the Prince's Court of the X-XI th c. with the Slavs, the Rus and the Viking inhabitants. It all started with our Prince leading the ting, which means the gathering, where he collected the taxes (we made him an embroidered shirt - photos when it's finished, because Robert didn't quite make it on time ^^, a pair of naalbinded socks and some braided straps), raised some slaves to a higher half-slave rank, judged any quarrels, etc. Robert read out our laws. Any free Draconian wanting to speak would step up onto the whalebone and shake the staff with bells, so everyone could pay their attention to him. 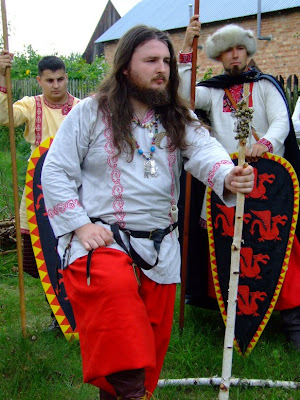 Free noble men would stand close to the Prince with their spears and shields. 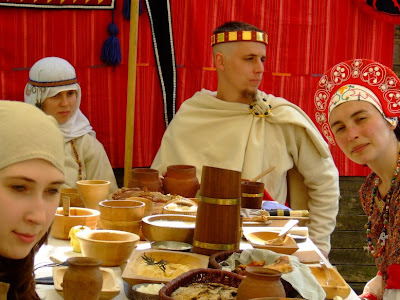 Among others, two of our people (mine and Robert's) were raised from the slave status to the half-slave rank - Osk (Anna) and Izbor (Peter). Then the Prince paid homage to our god Skwarowit thanking him for another good, fruitful year. 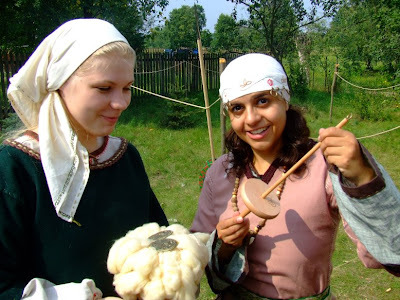 Here is Osk (Anna) and Hazine (Kate) with Anna's promotion gift from me - a drop spindle, some roving and a pair of Finnish buckles. Our Prince at the table. Unfortunately the weather wasn't that good all day, at one point we had rain and even hail... But we managed to eat a lot, sing a bit (me and my girls! 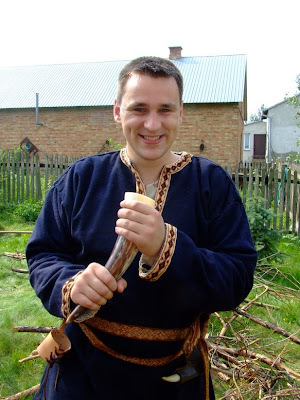 ^^), listen to some great Viking poetry written by Izbor (written by him, mind you! 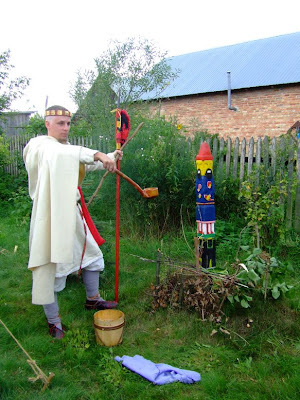 of course in Polish, but it really sounded like a piece from the Poetic Edda, he's gifted! ), some of us tried some archery and swam in the river. 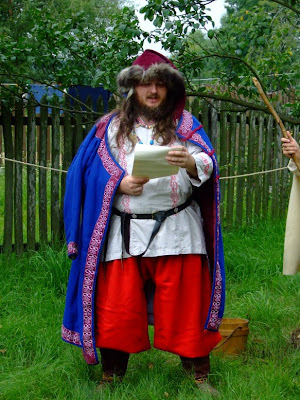 We (me and Robert) didn't prepare any new clothes for this feast, and I decided that my Russian outfit, although spectacular, will go to the bottom of the clothes chest for a while, because this year I'll be working on a proper Norwegian and Finish sets of clothes. 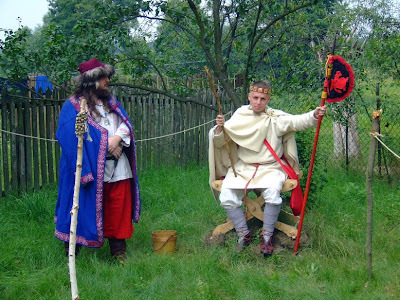 What's next on our reenactment events list? There are two XIII c. meetings in September and Robert will probably go to one of them, but I don't have a finished outfit so I'll pass on these ones. Then when the Spring/Summer season is over, we'll have one-day battle events in Autumn and Winter until the first warm Spring days and first market events of the next year. 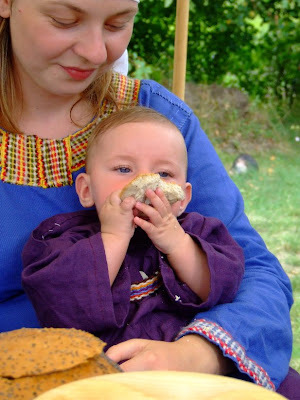 (I've been thinking veeeeeeery briefly about the possibility of going to Foteviken, Sweden, for a Winter market, but we'll see about that later). EDIT: Helene asked me about my Norwegian outfit plans. 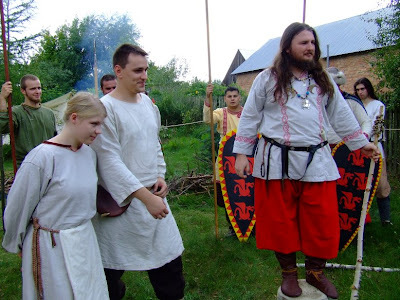 Well, I should've written "Viking outfit", but I chose a Norwegian persona for my reenactment (married to a Rus persona, a Varangian, hence my Russian clothes as a gift from my husband! *^v^*). I have some old Viking clothes, but I decided I desperately need a new set, so I started in May, when I made a new linen dress and started to embroider it (in progress). Then I'm going to make a woolen apron dress and another long-sleeved dress out of wool for Winter events, all of which will be embellished with tablet woven bands and embroidery (hopefully! *^v^*). And also, I need to change the lining in my long-sleeved coat, because it's cotton and should be linen, and add the tablet woven bands to it. Wow, love your stool seat!! Very Interesting and Great outfits! Sounds like even with the small setback in the weather you all had a great time.